Since my last post it's been kinda crazy around here (again or still). To start with, like most of the south it's been raining like never before almost every day. The ground squishes when you walk on it. Since we can't get it dry enough to cut the dogs now need bicycle flags to find them in the tall grass. They are not happy. Along with rain came the illustrious Cox cable truck who had backing up issues and dug a nice trench in our front yard with it's dual tires. And of course, it's too wet for them to come fix it yet. Great! You can't tell too good from the picture but this is over 100 feet and about 8 inches deep in most places! The Cox truck being here at all is another story. This guy was just one in a long line of technicians who have come to fix a problem that was outside, up a pole, not inside our house. But for some reason it seemed very hard to get the people taking our calls to understand that we need a maintenance call instead of a service call. So every guy they sent out left us shaking his head saying he should have never been sent. I'm sure by now, after all the calls my husband has made that they all know him on a first name basis at the call center! 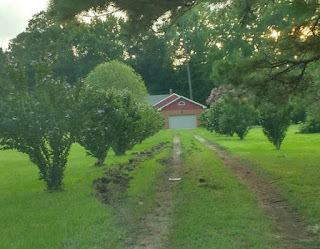 The good news in all this is that the guy who screwed up the yard was very happy to report that he had fixed the problem up the pole! Yeah! We'd been really contemplating going with Roku and dumping our TV service through Cox so after all this drama we finally bought one and are now trying to get used to it. We haven't settled on what service to use alongside Roku and am still doing the research to what will best meet our needs. I find there is some really random stuff available out there! We watch a lot of history and documentaries. I get the feeling most services cater to people who devour movies and music videos. So we're struggling a bit. I really miss my "regular TV." I had my final 18-month follow-up with my back surgeon and everything is good. I got a referral for back strengthening therapy and have just started that. Danny, upon seeing his PCP, finally decided to get shoulder therapy; it's been hurting for months now. His evaluation is next week, then we both go for 4 weeks. I bet I get lunch out of the deal too, since we have 11:30 appointments! I've been dealing with an IBS attack since Thursday afternoon. The timing couldn't have been worse since I'd just had my back popped and it was already very sore. Everything became 10 times more painful since I had to keep getting up and down every 20 minutes all night long. Silver-lining - lost 5 pounds! Yesterday was mostly a soup day and I'm still eating tenderly today, hoping to use this weight loss as a jump start for healthier eating (but you know how easy it is to fall back into the junk food ways).